Of the three specific ways to establish a calorie deficit...diet, regular exercise, and cardio...making conscious food choices is by far the most beneficial way to reduce your caloric intake. Burn this into your brain: There is NO WAY you can possibly exercise-off or run-off enough calories to get rid of stomach fat. 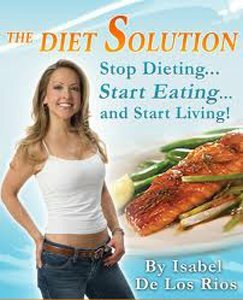 * Making good food choices by eating consciously means you know EVERYTHING that you are putting in your mouth...and if it will build lean muscle tissue or be stored as ugly belly fat. 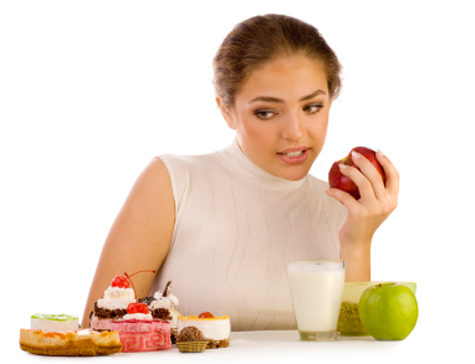 * Sugar foods taste good and are easy to eat mindlessly. They are most responsible for the storage of stomach fat. Get them completely OUT of your diet. No pastries, no pop, no cookies, no sugar cereals, no desserts. 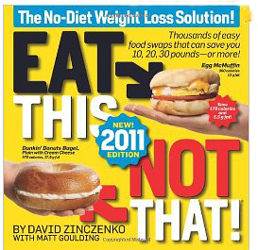 * Processed foods are next on your hit list. This includes bread and wheat products. 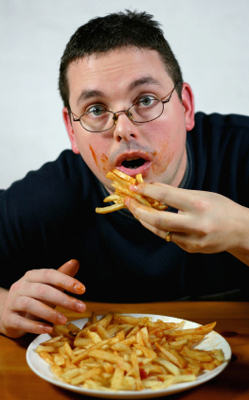 Starchy foods like pizza, spaghetti, breads, potatoes are way too easy to overeat. Start reducing portions immediately...and work to make them a minimal part of your lifestyle diet. * Fried foods need to go. Fat-loading has NO place in your weight loss plans. * Fresh fruits, leafy green vegetables, and raw nuts must become priority foods in your diet. * Start drinking more water. It will definitely help you reach your fat loss goals. Shoot for being comfortable with drinking a gallon per day. The benefits of drinking water are gigantic! * Getting on a regular and consistent exercise program, that includes weight training and interval workouts, will accelerate your fat loss. Making good food choices can only be done with conscious focus until it becomes a lifestyle habit. You will not only look better, you will feel better when you start seeing the fat pounds come off. Male belly fat is a turn-off to women. Get rid of it now! The Flat Belly Solution is the most popular diet for women...because it works!